Priyanka Chopra was among the best dressed ladies at the 69th annual Emmy Awards. The Bollywood star and former Miss World wowed the crowd in a stunning white feathery look from Balmain. While everyone else was fussing over her embellished Balmain gown, we were busy drooling over her jewels. This former beauty queen is no stranger to wearing expensive bling. During last year’s Oscars, she wore $8 million worth of jewelry with her strapless Zuhair Murad gown. This time at the Emmys, Priyanka kept up the luxe look with Lorraine Schwartz jewelry. 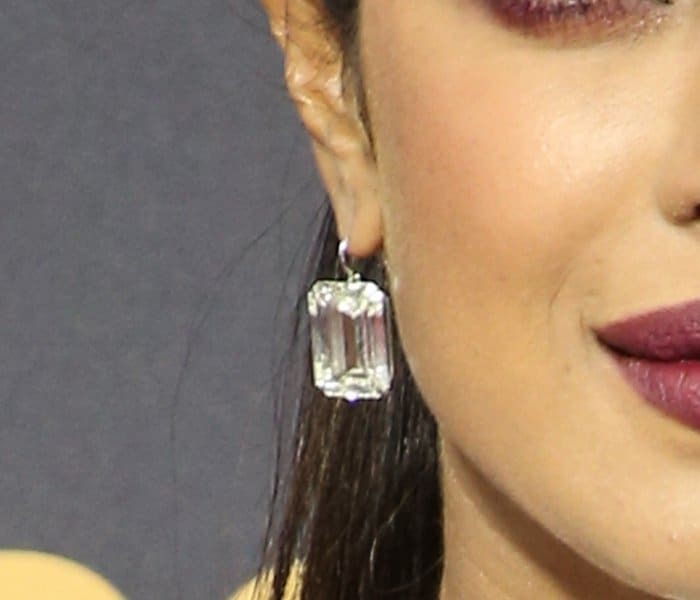 Amping up the glam of her already bedazzled gown, the 35-year-old Indian actress also wore a pair of 62-carat emerald cut diamond earrings and a 16.5-carat diamond ring. The total value of her jewels was more than $7 million! Priyanka Chopra attends the 69th annual Emmy Awards held at the Microsoft Theatre in Los Angeles on September 17, 2017. Priyanka amped up the glam with a bedazzled gown and Lorraine Schwartz diamond accessories. The former beauty queen wore huge diamond earrings with a total weight of 62 carats. She kept her hair clean and sleek in a high ponytail.